Glinus lotoides Linn., Sp. Pl. 463. 1753. Post, l.c. ; J.Cullen, l.c. Annual procumbent herb up to 40 cm long, with stellate woolly parts. Leaves sub-verticillate, 0.6-2.0 cm long, 0.5-1.8 cm broad, orbiculate or more or less cuneate, often mucronate; petiole 2-8 mm long. Flowers in axillary clusters of 5(-6), sub-sessile; pedicel up to 1.5 mm long. 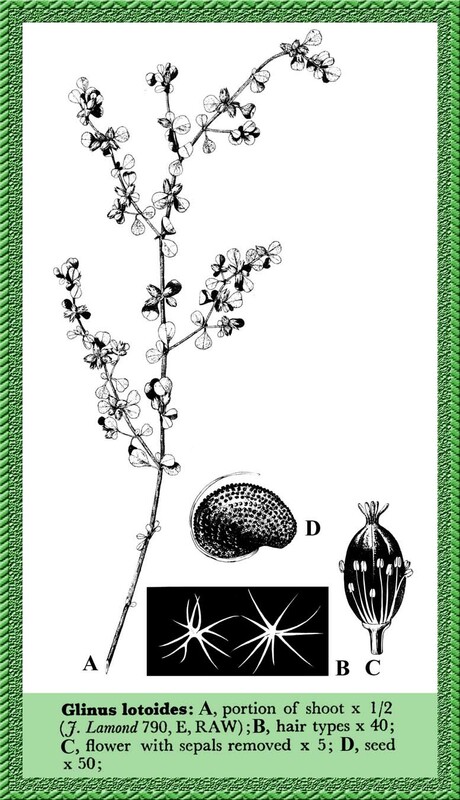 Sepals 4-4.5mm long, up to 7 mm in fruit, persistent, ovate to ovate-oblong, apiculate, imbricate. Fertile stamens 12; filaments 2-3.5 mm long, unequal, persistent; anthers less than 1 mm long, bilobed. Ovary c. 2 mm long, ovoid. Stigmas 5 (4), linear, c. 1 mm long, persistent. Capsule sub-globose or oblong, c. 6 mm long, membranous, enclosed in the sepals. Seeds many, less than 1 mm long, tuberculate, strophiolate, with a curved linear appendage c. 3/4 the size of the seed. Type: Described from Sicily and Spain (Linn., 631/1). Distribution: Most tropical parts of the world; Ceylon, Africa, India, W. Pakistan etc. The tender shoots can be eaten as a pot herb. Also used in medicine and as fodder for goats.